Work smarter and more efficient! Don’t work harder or longer, work smarter and more effective! The belief that staying busy all the time means that you are working well enough to be productive is very outdated and misleading. The reality is that if you work for a company or some sort of institution you should work very well in order to keep your job and earn promotion. On the other side if you work for yourself you should work ten times better, because what you earn and how you grow your business depends on you. In other words the smarter and better you work – the less time you will spend on working and the better results you will have. 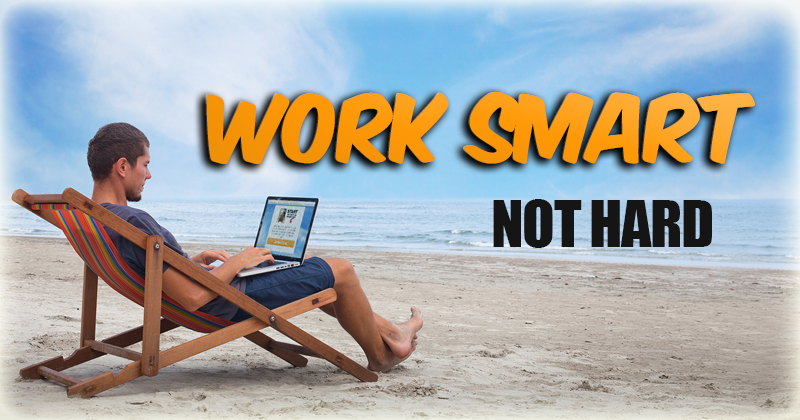 Why not switch to the smarter & more effective working mode and see what happens? When I was in school I made a discovery. I realized that if I am very focused and pay attention in class I will need to invest less of my time to study in home and therefore I will have more free time to play outside. Back in the days it was the smartest way to deal with the situation. After this discovery I was feeling better, because I had more time to do what I loved and also my results in school got better. I had proof that this works and since then I am always searching for better ways to do whatever I have to do. Pay attention that I am not saying easier! I am saying better! In this article I will share with you some ideas and solutions which I think you should try and implement in your daily life. I am sure that if you try them, you will surely come to a conclusion that working smarter can easily change your life for the better. Being aware and managing your time pretty well are truly essential and vital things. The golden rule here is to become aware which are the most important tasks which impact your business growth and focus only on them. Delegate everything else. At the beginning of your work day take time (just a few minutes) to identify your most crucial task and when you complete them you will feel that your day has already become a success and you won’t worry about other minor problems. As I mentioned, you should delegate as much as you can. Remember that time is much more valuable than money. It is always better to pay someone to do several things for you. This way you will achieve more than anticipated so that next time you will be considered as the best option for any given project, instead of falling behind schedule or providing some poor quality. Be smart and delegate some of your tasks to the right people. To get really involved in the task you are doing, put away everything that might distract or disturb you. I realized that the phone for example is very distracting device and I switch it off when I am working on important tasks. I recommend you do the same and as a result you will be able to concentrate more & better. If you work on computer or laptop I would recommend using Focus Booster. This tiny, little software will help you enhance your focus and concentration, so make sure you give it a try. If you want to be able to focus really well and handle what you need to do, you should be fresh and relaxed. Sleep at least 8 hours and if you can go to bed at around 10 pm as these hours are the best time for the relaxation of your body. If you go to bed at around 1 or 2 am you run the risk of not being able to get up in the morning just because you will be as exhausted. How can you possibly expect that you will get things done if you are being interrupted all the time. What is the most valuable use of my time? Work hard only after you learn how to work strategically? 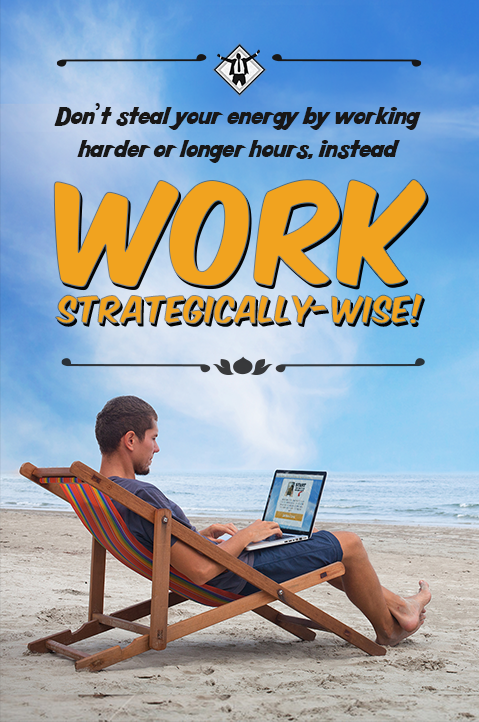 Don’t steal your energy by working harder or longer hours, instead work strategically-wise. Don’t set unrealistically high standards because in this way you doom your project from the very beginning. Rather focus on each step of the way, try to do your best and don’t think about what impression you will make on your clients, your boss or work colleagues. Most importantly, though, you need time to rest and eat. You can do nothing if you don’t take care of your body and mind. So alternate activity with inactivity, if possible; if not, just go outside or open the window and take a few deep breaths every now and then in order to refresh your mind and body. Have breakfast, lunch and dinner at set times and make your body feel at ease. So to sum up, working harder and longer doesn’t mean getting more work done. If you want to be truly productive, do work smarter. Take care of your body and mind and they will take care of your tasks. There is no point in getting frustrated over meaningless obstacles, just push them aside, in your mind, as well and follow your pre-set scheme. Overloading yourself could only result in failure and not in productivity. Try to examine yourself and find how you relax best. The fresher you are the smarter you will work. What’s more, think about utilizing your waiting time. When queuing up in an institutional building or traveling by underground to your next stop, take your notepad or your phone, your laptop even and finish just a little bit of work. If you are far away from the office world, why not scribble down the words for your next song or novel right in your napkin; why not finish knitting that amazing pullover in the train if you happen to be that kind of specialist. Wait! 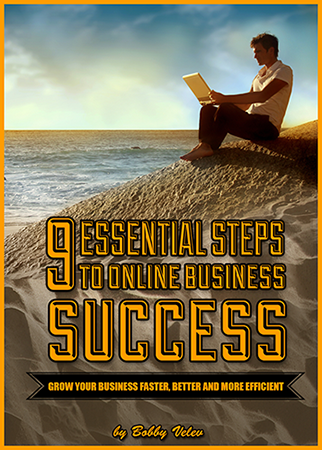 Do you want to learn the 9 essential steps to online success? 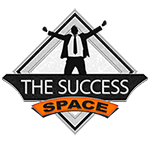 Join the Success Space club now and receive this ebook guide for free! Where do you want us to send you the ebook? We've just sent you a confirmation email!